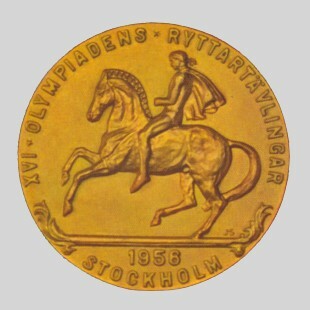 Silhouette of a Greek horseman, emblem of the Games, around which is written in Swedish: "XVIth Olympiad Equestrian Games, Stockholm - 1956"
Torch above the five rings with the inscription in French "Olympic Games" an the I.O.C. motto "Citius, Altius, Fortius". competition was the Frenchman J. Cariou on Mignon. King Gustaf V is here presenting him the Medal. 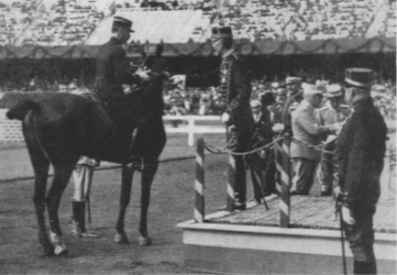 The Equestrian Olympic Medal was completed in April 1956. The one side of the Medal shows a relief composed by John Sjosvard. The other side of the Medal has been designed by the Interntional Olympic Committee and will henceforth have the same shape for all Olympic events. 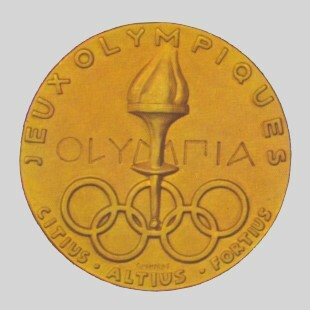 At the bottom of the Medal are read the words "Citius Altius Fortius", the Olympic motto, which means "Faster Higher Stronger".